Geneva [Switzerland], Nov 6 (ANI): A large number of exiled Uyghurs and Tibetans living in Europe on Tuesday carried out a massive anti-China protest rally here. They shouted slogans and labeled China a "terrorist nation". New Delhi [India], Oct 17 (ANI): The Central Tibetan Administration (CTA) on Wednesday marked the 60th anniversary of Tibetans in exile through a "Thank You India" campaign. Dharamshala (Himachal Pradesh) [India] Mar 31(ANI): Bharatiya Janata Party (BJP) leader Ram Madhav on Friday told Tibetans living in exile that they are not refugees and India is their land. Geneva [Switzerland], Mar 10 (ANI): Over a thousand Tibetans, living in Europe, gathered outside the United Nations in Geneva to protest against the Chinese government, urging the organisation to send a fact-finding mission to Tibet. New Delhi, [India] Mar 10 (ANI): Tibetans-in-exile held protest in New Delhi on Saturday to commemorate the 1959 Tibetan uprising. Shimla/Kolkata [India], Feb 16 (ANI): With the Tibetan New Year coinciding with the Spring Festival this year, it is a double celebration for the Tibetan community this. 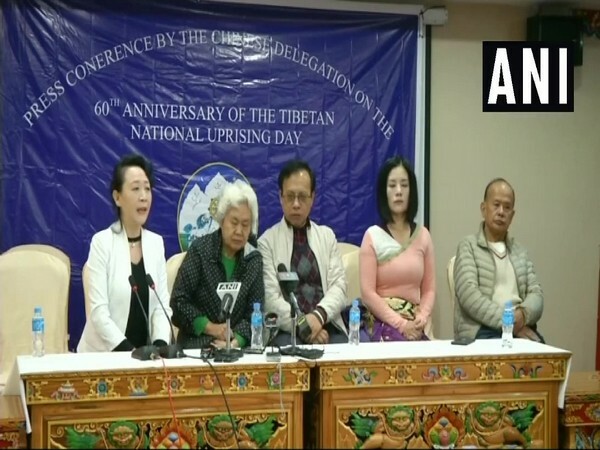 Itanagar (Arunachal Pradesh) [India], Dec.16 (ANI): A non-governmental organization in Arunachal Pradesh has appealed to national security agencies to find out whether the state government has appointed "Tibetans" to key administrative positions. Dharamshala (Himachal Pradesh) [India], Nov 27 (ANI): Tibetans in-exile on Monday staged a silent protest in Dharamshala, Himachal Pradesh, against their government's decision to remove Penpa Tsering as the North America representative of Tibetan spiritual leader, the Dalai Lama.